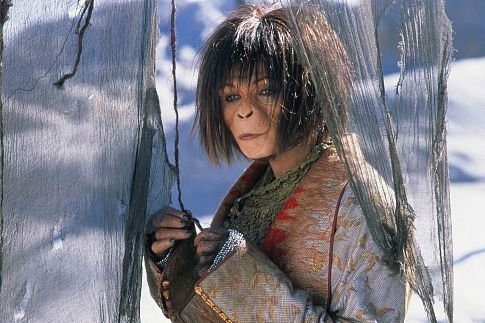 To call Tim Burton’s ’01 “re-imagining” of Planet of The Apes aggressively awful would be to do it a kindness. I fear no assemblage of words will do the wretchedness of this movie justice. Give a single monkey a single typewriter, a deadline, and a bottle of bourbon, he’d write a movie better than this one. I saw it when it came out, I remember thinking it was bad, but I had no idea. I’d blocked out at least ninety percent of it. I will, after writing this, endeavor to block out the rest just as soon as I can wrest my bourbon away from this monkey. Let’s start with a brief history of the long road to Burton’s shitshow. It began in a simpler time—the late ‘80s—with a script by a young screenwriter, Adam Rifkin. His vision was to make a sequel to the original movie, as though the other sequels hadn’t happened. Set three hundred years later, a descendent of Taylor’s (that’s Heston in the original) would lead a slave uprising in what would be, in Rifkin’s words, “Spartacus with apes,” and would potentially star Charlie Sheen. If only we’d been so lucky! Alas, it was not to be. Next up: Oliver Stone. Whose idea was, well, let him explain: “What if there were discovered cryogenically frozen Vedic Apes who held the secret numeric codes to the Bible that foretold the end of civilization?” We might take a moment to recall that Oliver Stone was at the time a notorious coke and heroin fiend. OR SO I HAVE READ (please don’t sue me). So what did Fox do? They hired director Chris Columbus and writer Sam Hamm. They retained the dead babies angle, only in their version the virus comes from a far-away ape planet, to which a pair of plucky scientists must travel to find the cure. No go. Next they went to James Cameron, Peter Jackson, Roland Emmerich, and Michael Bay. Everybody said no. Apes was dead in the water. Finally Fox hired screenwriter William Broyles Jr., who’d written Apollo 13 and Cast Away, to write a “man lost in space” version of the story. Because execs are clever that way. Broyles took the bait and churned out a script so remarkably bad it was impossible for the studio to resist. Tim Burton read it, loved it, and it was fast-tracked into movie-making history. And I do mean fast-tracked. Sets were built, a release date set in stone, filming begun, and all with nary a thought to fixing the screenplay beyond one draft by a pair of script doctors. The results? They speak for themselves. Let’s begin with the positive. 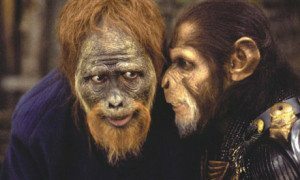 Genius special effects master of all things simian, Rick Baker, does a tremendous job with the ape make-up. And now, on to the negative, i.e. everything else. Our story begins on a space-station orbiting a planet that is clearly not Earth. 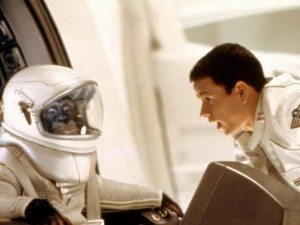 Captain Leo Davidson (Mark Wahlberg) helps a scientist lady with her genetically modified chimps, who have been trained to fly space pods. One chimp is sent into an approaching electromagnetic storm—and vanishes! Against orders, Leo flies another pod into the storm—and vanishes! Exciting stuff. His pod reappears over the planet and crash lands in a jungle. Glimpsed on his control panel is the date whirling ahead by hundreds of years. Leo doesn’t notice it. Oh, to be oppressed and imprisoned! Who will do my hair now? In the jungle he meets a group of well-coifed humans, done shooting a nearby music video by the looks of them, running from apes on horses. Leo is rounded up with the extras, put in a cage, and wheeled away to ape city. 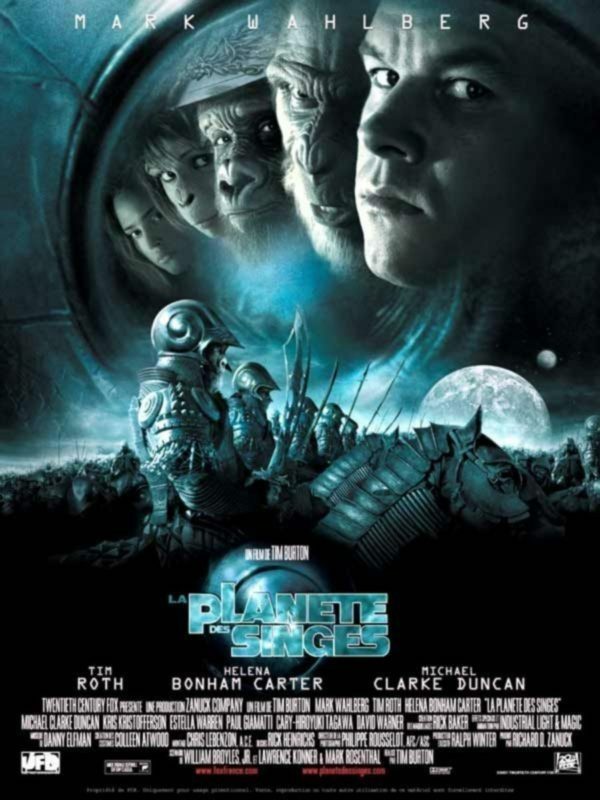 Because this version of Planet of The Apes has nothing to say about anything, Leo, as a character, is a total blank. He can literally be described as “a pilot.” That’s his whole character. In the original, a movie with quite a bit on its mind, Charlton Heston’s Taylor is introduced speechifying about humanity’s worthlessness. He’s gleefully misanthropic, overjoyed to have escaped Earth, sure that if they find any form of life, it’ll be better than what they left. Which gives the surprise at the end—he never left Earth! They blew it up!—thematic weight. There is no weight in Tim Burton’s remake. There is no theme. It is literally a movie about nothing. Ape city is a kind of small mountain on which all the apes live in adjoining one room homes. Or something. It’s mostly dark and for all the money they spent on this movie looks cheap. We meet the mean and nasty General Thade (Tim Roth), the weasely Limbo (Paul Giamatti), Senator Sandor (David Warner), and his daughter, Ari (Helena Bonham Carter), who is a known “human lover,” and hates to see them hurt so. The apes have relationships with one another, but they’re so poorly rendered, and ultimately so meaningless, there’s no point in thinking about them. General Thade is bad and Ari is good. That’s all one has to recognize, and that’s all the script is capable of making clear. The performances are hard to judge because nobody is given any material to work with. There’s no logic at work, no ideas being presented. That said, Tim Roth chews scenery like his life depends on it, and Helena Bonham Carter seems to think she’s in a performance of Cats. We learn that Thade is a direct descendent of the original founder of the apes, Semos, who came from a place called Calima, now located in the “forbidden area.” Leo has a locater device showing where his space station is waiting for him, and it’s smack in the middle of Calima. He escapes ape city with Ari, Limbo, and some humans, and off they go, with Leo apparently not worried about his space station having “landed.” Maybe it’s the kind of station that lands on planets? What do you know, they find the crashed and burned space station, and oh my gosh, it’s been there for three thousand years. The descendants of the modified apes turned into the super-apes, and the humans are the descendants of the crew. The name Calima? From a partially dirt encrusted sign on a cage reading CAUTION: LIVE ANIMALS. 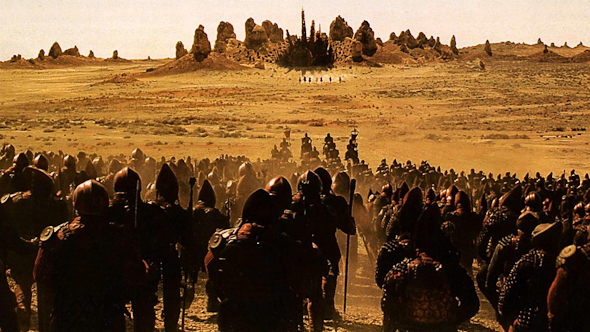 A reveal I liked a lot more when I saw it done in Zardoz. What’s left now but for a human/ape battle? They fight it out, when from the sky comes the missing pod piloted by a chimp. The storm sent him to this very moment in time. And his arrival is important why? I have no idea. Everyone’s pretty surprised, so there’s that. Leo has a final showdown with Thade in which Thade is almost but not quite killed. Leo waves goodbye, gets in the pod, and flies up and into the electromagnetic storm, still conveniently located above the planet three thousand years after he first saw it. It zaps him back to his own time and directly to Earth, where he crash lands on the mall in D.C. He stumbles up the steps of the Lincoln Memorial to see not Honest Abe—but General Thade! Cops and reporters pull up–and they’re all apes. They’re all apes! Oh my god! You know what this means, don’t you?! DON’T YOU?!?! No? That’s okay. No one else does either. Burton said it’s not supposed to make sense, it’s just supposed to be weird and surprising. This sums up the entire movie. It’s not supposed to mean anything, it’s just supposed to be weird. Thanks, Tim. Way to take a story with built-in allegorical resonance and turn into a “Burtonesque” sideshow. Here’s the thing about Tim Burton: he is a director bereft of imagination. He uses visual gestures in place of story, character, everything. And they’re the same visual gestures, movie after movie. They were great fun in his best movies, Pee-Wee’s Big Adventure and Beetlejuice, but it’s been diminishing returns ever since. (His one foray into something different, the wonderful Ed Wood, was his biggest commercial failure). 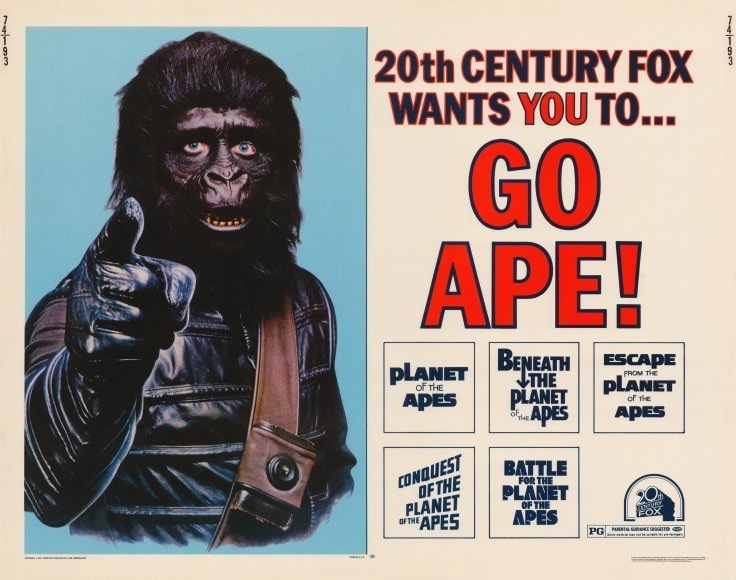 Aside from the tired visuals, Burton’s Apes includes two of the laziest dialogue call-backs I’ve ever seen. 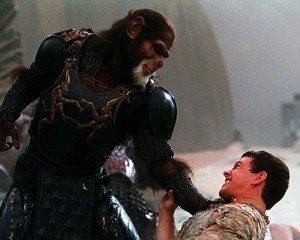 When Leo is first captured he touches the leg of an ape, who says, “Get your damn hands off me, you damn dirty human.” We’ve never met this ape, the movie has barely started, the line means nothing in context. It’s there because that’s where Broyles stuck it in. 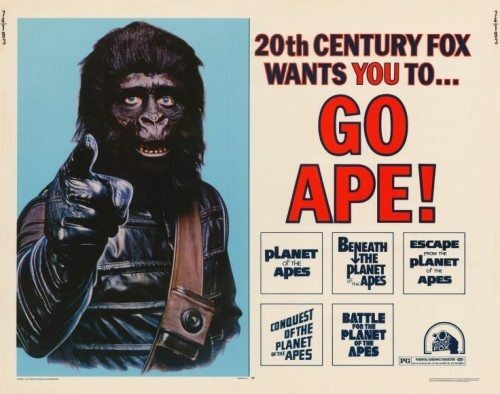 Even worse, Charlton Heston appears late in the movie, unrecognizable (and uncredited; I learned it was him thanks to the interwebs) in old-ape make-up, to say, “Damn you, damn you!” Again, without any relevant context or connection to the original. It’s there so we can say, Ooh! He said it! He said it! I am in this movie because…um…where’s my check? Burton’s Planet of The Apes is the worst Apes movie of them all. Even movies as bad as Battle and Conquest, cheap and simple-minded and absurd as they are, exist to shine a light on our (then) present world, however ham-handedly. Burton and Broyles have not a single deep thought between them. Their movie is nothing but a cash grab thirteen years in the making. Or in Star Trek: The Motion Picture. As in V’ger. Yeah, how do you make an ending like that that changes everything, but doesn’t actually make any sense. How!? You don’t care, is how. I forgot about Star Trek. Popular trick.